To be honest, although stylish and classy beards are trendy nowadays, who doesn’t want to have a smart look by having a shave as smooth as possible, almost no one. If you are a shaver, you would agree with me that a perfect shave doesn’t only depend on the shaving lather or razor. It also depends a lot on the shaving brush you select for shaving. In essence, a man’s grooming kit is incomplete without a shaving brush. If you are a shaving enthusiast you would know what synthetic shaving brushes are. However, if you are just starting out shaving or want to know the basics, let me tell you synthetic shaving brushes in opposed to animal hair brushes use bristles made from synthetic fibers. Personally, I just can’t stand the thought of animal cruelty just to be of some use to men where we can use synthetics. In addition to this, synthetic brushes provide much more value and are relatively inexpensive. I will provide a detailed account of why I believe synthetic shaving brushes are much better than animal-hair shaving brushes later on the in the piece. Selecting the best synthetic shaving brush is not an easy task for everyone. For your convenience, I have compiled a list of top 10 synthetic shaving brushes which may help you out in choosing a synthetic shave brush for a clean and smooth shave. Since its launch in 1973, Parker Shaving company has been producing class-leading shaving products. The company is well known for its products worldwide. The highest standards of its products including the Parker synthetic bristle brush have given this brand a high reputation among its customers. Parker offers a wide selection of shaving brushes. What I really like about Parker synthetic shaving brushes is that they are handmade and this fact alone means special attention to every piece they are producing. They produce different styles of shaving brushes depending on the style and type of the bristles used in order to satisfy a wide variety of their customers and meet their requirements. Although this brush has an eye-catching blue wood handle, Parker has its main focus on the bristles. This is because that is what really matters. Bristles are important in exfoliation of the skin, the richness of the lather and the amount of water brush retains. All these factors depend on the density and softness of the bristles. This Parker synthetic shaving brush we have at hand is amongst best their products and is one of the best-selling in its category. The first thing you are going to notice about this shaving brush is that the bristles are extremely soft and have high density to produce a rich lather. The bristles are totally made of synthetic material so it is a great choice for vegans. The fast drying ability of parker synthetic brush makes it an ideal brush for traveling. This is because of the high quality of the synthetic material used which is resistant to water absorbing. Peoples with sensitive skin often feel difficulty in choosing the right synthetic shaving brush for them. The bristles of Parker synthetic brush are extremely soft. So, if you have a sensitive skin you can blindly trust this shaving brush as it doesn’t irritate the skin as more of the badger brushes do. Rich lather is what everyone one wants to have while shaving. So, if you are searching for a brush which makes a rich lather you might be interested in Parker synthetic shaving brush. This is because it contains dense bristles which create an extraordinary lather. As different brushes have different dimensions, so it’s not necessary that one brush would fit in the stand of another brush. Therefore, Parker shaving brush also includes a brush stand and this to user-friendliness and convenience. You are going to love the blue-wood handle which looks great and is durable. It has dimensions of 5×2 2×2 and is 2.1 inches high. However, the issue with the handle is that it loses its color very quickly. Vikings Blade is an Australian-based brand which specializes in making shaving tools since 1985. In contrast to newer companies which are focusing to modernize industry, Viking Blade has the old-fashioned customer service principles where the customer is in direct contact with the business owner. This helps them build up a customer-friendly atmosphere and long-term attachment to the company. In their efforts to produce high-standard products at an accessible price, Vikings Blade recently launched their brand new product in shaving products. This is the Dark Raven Luxury Shaving Brush. This shaving brush uses high-end synthetic bristles which makes it competent to costly silvertip badger brushes. The dark handle of the brush with a gunmetal steel base gives it a highly attractive look and makes it form one of the heaviest synthetic brushes available. One of the features I really like about this shaving brush is that it retains high amount of water which enables to create a lather rich in quality and amount. It works great with both creating bowl lather as well as face lather even with a hard soap. Everyone wants to have something which makes them feel luxurious. The black handle accompanied by a metal base in Dark Raven synthetic shaving brush gives it the look you are looking for. The heaviness of the handle makes it comfortable to hold for the user. Combination of softness and stiffness in this synthetic shaving brush makes the bristles to not only spread on the top of the hair but to reach it deep on the skin. Less shedding of the bristles keeps you away from that irritating feeling of bristles everywhere on face, but if we go for the longevity of the brush it starts shedding slightly after more usage. The Dark Raven Luxury synthetic shaving could be an ideal choice for the ones who choose to give a luxurious look to their personality especially while traveling. Perfection is a relative term as everyone has own priorities and expectations, however, if I was you I would have surely given this shaving brush a try. This is because all I want is great finishing quality with soft sensation on the skin and making a rich lather. It additionally comes in a tube which makes it a perfect choice as a gift for shaving males in your life. Stylish look of the brush with a gorgeous tube. Haircut and Shave Co. offers men’s grooming tools at extremely competitive and reasonable prices. They claim that main focus of the company is to make what customers exactly need in their products which can satisfy them. What makes them unique from other companies is trendy and advanced look to their products. Basically, it is easier to create a rich lather when each bristle of the shaving brush is lifted. Using this fact, Haircut and Shave Co. have designed this synthetic shaving brush to give their user a rich lather. Tugging of the bristles can irritate the skin, therefore, each hair strand is cut in a clean way. Generally, the synthetic brushes are considered to be much stiffer than animal-hair brushes, but the bristles in this synthetic shaving brush gives maximum soothing sensation. It also helps with gentle exfoliation of the dead skin cells. What I really love about this brush is its handle which is a bit different from other shaving brushes. The handle looks great and provides good control on the shaving brush while applying the lather. In addition, this brush has thick density of the bristles which helps with producing rich lather and keeps the extreme softness at the same time. This fact also gives great control to the knot of the brush while applying lather on face. This shaving brush comes at a heavier weight which helps in giving you a great sense of control. Therefore, you will feel like you are driving the car rather car driving you. For the purpose of this review, I used this shaving brush and was surprised by the rich lather it produced from a relatively less soap or shaving cream. This is because it holds plenty of water and thus makes great lather. It is fast and efficient at spreading of the shave lather. You would agree with me that shedding of the hairs is what irritates everyone. I have used this brush for three months now and lost precisely 3 bristles on first use but none since, so far so good I think. The issue you can encounter with this brush is that because of its different design it may not fit your existing stand. Additionally, because of its design, you may need some getting used to. However, the overall performance of this synthetic shaving brush needs to be appreciated, without any exaggeration. The Body Shop is from one of few brands of the world which are committed to enrich and not exploit. The company promises to provide products which are customer friendly and not exploit the customers by higher prices and making false promises. It deals in many personal products which include skincare, body, fragrance etc. 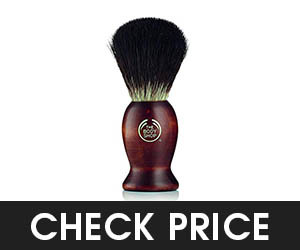 Men’s wooden shaving brush is amongst the best shaving products by the Body Shop. As the name is enough to tell the story, this wooden shaving brush by Body Shop uses a wooden handle instead of using metal or resin. The synthetic bristles of the brush are perfectly designed to increase the lather produced by the shaving cream or soap. The wooden handle is made of Russian birch wood and gives a softer touch. In addition, its short rounded handle makes it easy to hold in the palm. The wooden handle of this synthetic shaving brush gives it extra grip on the hand while applying lather on the face. You would have heard people saying that synthetic shaving brushes don’t make much lather but at least it is not true for this synthetic brush. It produces enough lather for a shave. This combined with its extremely low cost than expensive badger brushes makes it a perfect budget-friendly shaving brush. Although bristles are not as soft as other expensive synthetic shaving brushes, it surely does not give the weird scratchy feeling on the face as hard brushes do. Bristles falling rate is very low as compared to the traditional badger brushes. Overall, this is a cost-effective synthetic shaving brush which is not as soft as other expensive synthetic shaving brushes, but it does its job. Razorock started its business in 2009. Most of their products are in men grooming. They produce a variety of products including pre-shaves, shaving cream and shaving soaps, aftershaves, razors, bar soaps, accessories and kits, shaving gels, fragrances, alums, and deodorants. Plissoft is one their finest and class-leading products and has made a name for itself. If you don’t want a dead animal on your skin first thing in the morning, then go for Razorock. It uses synthetic fibers for producing bristles which are free from animal fur. Literally, they put a description on this shaving brush “no animal was harmed in the production of this brush”. The Plissoft synthetic shaving brush produces a great lather in a short time because it contains synthetic bristles. These bristles don’t absorb water and thus help in making lather easily and fastly which makes it ideal for the travelers. Sensation of the brush is very soft and smooth on the face. You don’t feel like something is scratching your face as you feel in hard badger brushes. 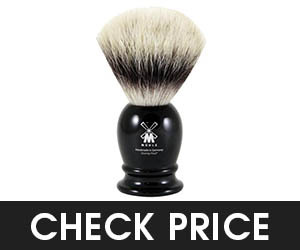 When comparing the prices of Plissoft synthetic shaving brush with the traditional badger/boar brushes, it is available at much less price but provides great quality lather and performance which is not less than the hair brushes. The weight of this synthetic shaving brush is very less. Its 24mm knot size and small size makes it favorable to use when you are traveling somewhere. The bristles falling percentage in Plissoft synthetic shaving brush is very less even after using it for more than 5-6 months. Every brand tries to meet its customers’ requirements. Satin Tip claims that this brush is made up of pure synthetic material. Soft and stable synthetic bristles are used to make a rich lather. The handle of the brush is made of low slip rubberized coating for good grip and stunning look. 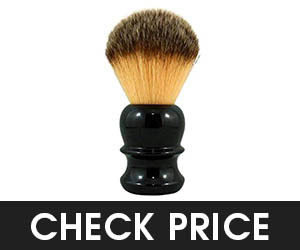 Soft and firm bristles of this synthetic shaving brush give a soothing sensation on the face. In addition, you are going to love the fact that the bristles don’t shed more often. What I personally liked about this brush when I used it was a small size and the rubberized coating of the handle. This provides an easy grip. The black color of the handle gives it an attractive look. All the travelers want to have a shaving brush which must dry faster so they keep it in and start their journey again. 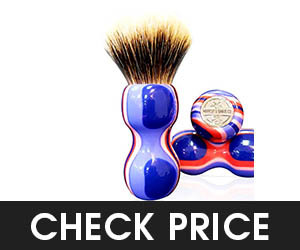 Quick drying of the bristles and small size of this shaving brush make it ideal for travelers. However, this synthetic shaving brush overall works well, but it’s upon the user how he takes care of his shaving. Although the knot of the shaving brush is firmly fixed in the handle, but may entirely fall if mishandled. 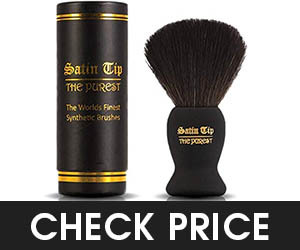 Satin Tip synthetic shaving brush is not a bad choice as compared to its cost. GBS offers different products including classic shaving tools for the people of all ages. The best thing about GBS is its improvement and innovation in products with new trends. The products of the GBS are tested and approved and are used by the barbers across the USA. Customers satisfaction is the priority of GBS, therefore, the even offer money back guarantee and tries to find the solution of the problems faced by the customers if contacted. The classic synthetic shaving brush by GBS consists of high-quality synthetic bristles having an ebony handle. It gently exfoliates the skin because it consists of soft and flexible bristles. While retaining the water on the face, it creates rich lather making it good for wet shaving. Soap bubbles are created quickly by this synthetic shaving brush and it holds enough amount of water for perfect ratio of shaving cream to the water. For starters, it is a nice brush to use as it is not that much costly and has decent quality. With traditional badger shaving brushes, there is always a complaint of bad odor, therefore it is pretty fine to use this synthetic shaving brush to avoid that annoying bad smell. Although the texture of the bristles is not as much as that of other expensive shaving brushes, but the bristles shedding in this synthetic shaving brush is very low. The most amazing thing about this shaving brush is that neither it is too soft nor too stiff so it does not gives a scratchy feeling on face. If we sum up the things, I feel that it is good synthetic shaving for the starters who don’t know the proper usage of shaving brushes and may destroy their expensive shaving brush. Although it doesn’t have a fancy look, it is pretty decent for wet shaving at home. Fine Accoutrements focuses on making shaving products inspired by vintage products used by our forefathers. The company approach is based on the merging of traditional methods accompanied by the latest trends of the market in their products for men. Fine Accouterments have a nice range of grooming products made at high standards to compete with the market. Angel hair synthetic shaving brush has maintained the traditional look of shaving brushes with updated synthetic bristles and a decent handle. As compared to costly high-grade badger/boar brushes, the quality of bristles is great enough at comparatively less price. This brush contains what someone wants in a shaving brush that is high-quality synthetic bristles making it great for vegans with negligible shedding and a solid resin handle. 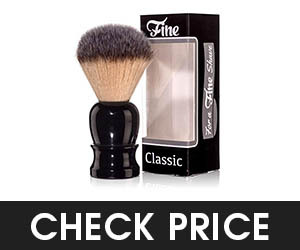 Being a synthetic shaving brush, the bristles are extremely soft making it great if you have sensitive skin. You won’t feel any scratchy feeling while spreading lather on the face. As shedding of bristles is almost negligible as compared to other shaving brushes, this makes it long-lasting. Although it is light in weight, it is able to spread lather uniformly on your face. In addition, it dries up quickly due to its synthetic bristles as badger brushes take a long time drying. Overall, this brush looks fine and performs well for wet shaving. Although the look is not that attractive, it is a nice addition for using it home. If you are a starter, then you should give it a try as it is available at a cheaper price as compared to the traditional badger shaving brushes. The pioneering enterprise of Muehle is Stützengrün, Saxony based, however, its products are distributed worldwide. Since 1945, Muehele’s business is now into its third generation but still, they have kept their high standard of product to satisfy their customers. The high quality of products has made them a leading provider of wet shaving accessories. Muehle provides different shaving brushes with handles of different material and Muehle’s shaving brush with fiber is one of them. A high-grade resin is used for the making of synthetic bristles after a lot of processing and refining. Muehele has offered synthetic bristles of the shaving brush whose characteristics are almost equivalent to those of natural badger hair. The bristles are soft and stable as compared to natural hair, which makes them produce soft sensation on the skin. The non-absorbent quality of the bristles results in less usage of the shaving soap or cream and at the same time helps in quick drying. If you are used to of wet shaving ultimately you will want high quantity and rich lather, so this synthetic brush would be a nice choice if you want a lather monster shaving brush. Controlling a brush is not an easy task for the starters especially if the brush doesn’t have a backbone. You will feel a good control on the knot of the brush because it has a nice backbone accompanied by the great soft sensation on the skin. The small size of the brush makes it easy to carry with if you are traveling. Drying of the brush is what matters most for the travelers. Finely designed synthetic bristles of this synthetic brush make it dry quickly to resolve this issue. Although it doesn’t hold much water as compared to badgers, the amount of water it holds is enough for producing rich lather in bowl or face. 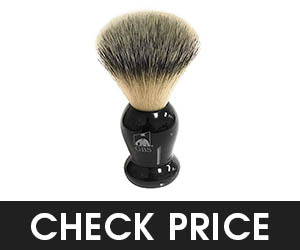 The cost of the brush is slightly high form ordinary synthetic shaving brushes but overall it’s affordable if it performs as per your expectations. So, in a nutshell, this synthetic brush has almost all those characteristics which one expect from a shaving brush. The small black handle gives it a traditional look as well and makes it ideal for the travelers, but if you are used to of using other brushes it may irritate you in the start. Fendrihan is one of the leading online retailers of shaving and grooming products since 2007. It offers a wide range of men’s grooming accessories at unbeatable prices and black and white synthetic shaving brush is from one of them. Company’s motto is to provide a solution for every individual whether it is about shaving or men’s other grooming products. 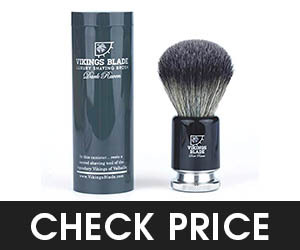 Black and White synthetic shaving brush by Fendrihan is a great combination of soft sensation and luxurious feel. 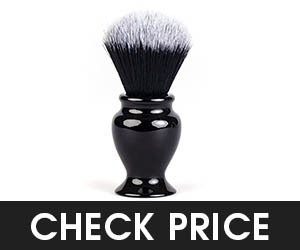 Synthetic bristles of this shaving brush are black at the bottom and white at the top which gives them extremely stunning look. These superior quality synthetic bristles make them feel very smooth and give a soft sensation on one’s face. Its sleek black resin handle comfortably fits in one hand and its polished surface gives the shaving brush luxurious look. I was skeptical thinking as the bristles were extremely soft that it might not make enough lather, but this was not the case and I was surprised by the amount of lather it produces. Bristles are so soft that one would love to caress his face even without shaving cream (on a lighter note). But literally, it does give a smooth sensation on the face and is not scratchy like ordinary shaving brushes and works great for sensitive skins. One of the reasons I started using synthetic brushes is because bad odor of the badger brushes irritates me and as Fendrihan black and white shaving brush contain synthetic fiber, therefore, it doesn’t smell bad at all. Shedding of the hairs is the main issue of shaving brushes, but this one works fine and doesn’t shed annoying bristles on the face or afterward. In short, Black and White synthetic shaving brush have almost all those features which I or you would expect from a shaving brush. Cost of the brush is reasonable if we compare it with the overall performance of the brush, however, the weight of the handle may create difficulty for those who like lightweight brushes. Heavy weight is problematic for some. 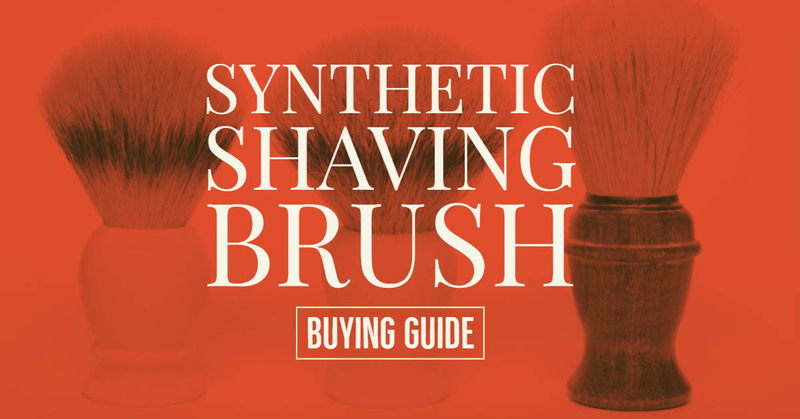 Why Choose a Synthetic Shaving Brush? When it comes to choosing your next shaving brush, you may have different types of brushes to choose from. Here I have highlighted some features of the synthetic shaving brushes which will make you believe why synthetic shaving brushes are better than the other types of shaving brushes. 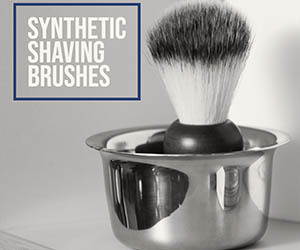 As explained earlier, the synthetic shaving brushes are made of synthetic fibers instead of hairs of animals. Therefore if you are an animal lover like me you will surely not consider a shaving brush made up of hairs of the horse or any other. So the other better option remains is using a synthetic shaving brush. The bristles in synthetic shaving brush are made up of synthetic fibers that are non-porous in nature i.e. they do not allow water to be absorbed in them. This is why they don’t absorb shaving cream or soap as the natural hairs of animals do. It means that synthetic shaving brushes will eventually save the more usage of your shaving cream or soap and of course your money. Traditional shaving brushes use bristles i.e. hairs of badger that absorb water because they have pores in them naturally; therefore they take a long time in drying. In contrast to the bristles of badger, the synthetic shaving brushes use synthetic fibers which do not absorb water. Therefore, they don’t take much time in drying as compared to brushes which use badger hairs. It is a good choice for people who keep traveling because the synthetic shaving brush will dry quickly and can be kept in your shaving kit. This dryness of brush will not allow the bacteria to live in the brush. Knowing what should be the right ratio of water and shaving soap or cream for building up enough lather in badger brushes is not that much easy. The water-absorbing nature of badger brushes make it difficult to know when you have got the perfect ratio of water and shaving soap. As the synthetic shaving brushes use synthetic fibers which are non-absorbent in nature, therefore, it is easy to have good lather having good water and soap ratio. Within no time synthetic shaving brush gives you the perfect lather for your shaving. Hopefully, it would not be difficult for you to decide which synthetic shaving brush is going to work well for you and meet your expectation. All the necessary information which ones need to select the best synthetic shaving brush is provided. But, if you are still confused let me explain what you need to take into account before deciding to select any synthetic shaving brush for you. The bristles of the shaving brush are the most essential part of a synthetic shaving brush. If the bristle of your shaving brush doesn’t hold enough water to make rich lather then it not suitable to go for it. Everyone wants is a good lather either it is with a soap or shaving cream. The other factor which should be considered is the softness of the bristles. No one likes to have a scratchy feeling on the face while applying lather. Therefore, if the bristles are too stiff, then I will not surely recommend synthetic shaving brushes to those persons who have sensitive skin. The bristles of the brush neither should be too stiff nor too soft. Sometimes too soft bristles also create problem while spreading lather on the face because it is difficult to control the brush due to a weak backbone. Finally, the most important irritating about most of the shaving bushes is falling off of the bristles. Is there anyone who wants hairs spread on his shaving soap or face? Of course no one, therefore it must be considered that the rate of falling of bristles is not too high or often. The handle of the brush is what gives you a grip and control on your shaving brush while applying lather. If the handle of the brush is too small or too large it will create a problem for you. However, brushes with small handles are useful for travelers. The design and material used for developing the handle will make you decide whether it will give you good control on your brush or not. Different shaving brushes have the different type of handles. Some of them have the same old traditional look of handles while some handles are bit attractive and feel luxurious. However, the looks of the shaving brushes have nothing to do with the overall performance of the brush, it’s just upon the personal likeness of the user, so do not make attractive and shiny looks fool you. The knot size of the shaving brush plays an important role in making rich lather from a shaving cream or soap. Therefore, it should be neither too big nor not small. However, I will recommend the brush with size ranging from 22mm to 24mm it may give you the performance you expect. One synthetic shaving brush could be cheaper for some and very expensive for the other. So, basically it doesn’t matter much, but the reason to include it here is that no one wants to waste his money. Therefore, if you are a starter you should go for synthetic shaving brushes available at low price so that you should not destroy an expensive shaving brush just because you are an amateur or starter. Shaving brushes are an important part of wet shaving. There is a complete science behind how different shaving brushes work and how they interact with every skin. We have tried to include a number of synthetic shaving brushes. 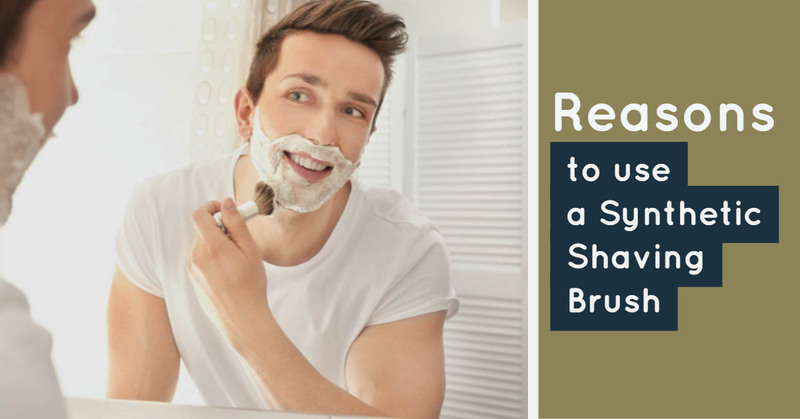 I hope after reading this detailed article, the selection of best synthetic shaving brush will not be a big deal for you. But still, if you have any query or confusion feel free to ask in our comment section.